I have to confess something! 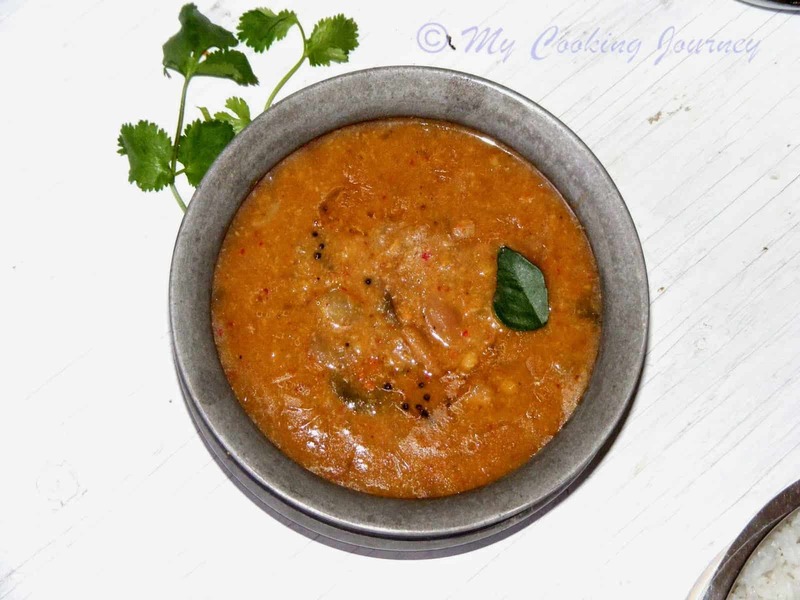 Well, it is not a big deal, maybe….but for me it feels like I learned a whole new thing when I made this Sambhar Sadham recipe. Forever I have been thinking that Bisi Bela Baath and Sambhar Sadham are the one and the same. I was very ignorant and when people tried to explain it to me, I still stuck to my line of thoughts and believed that they are the one and the same. 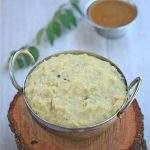 Finally, it dawned on me that Bisi Bela Baath is a Karnataka specialty and it has a different masala paste. 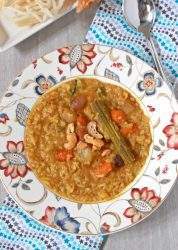 The South Indian Sambhar Rice, is Tamil Nadu special and is very famous in restaurants. 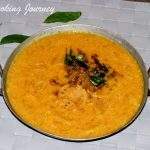 Reading further upon it, I read that it is very similar to the araichu vitta sambhar recipe I make. This week, my theme for Blogging Marathon is One Pot Meals. This is one of my favorite themes to blog about as I love making one pot meals. One pot Meals are a lifesaver on a busy week day nights or a crazy activity filled Weekend lunch. 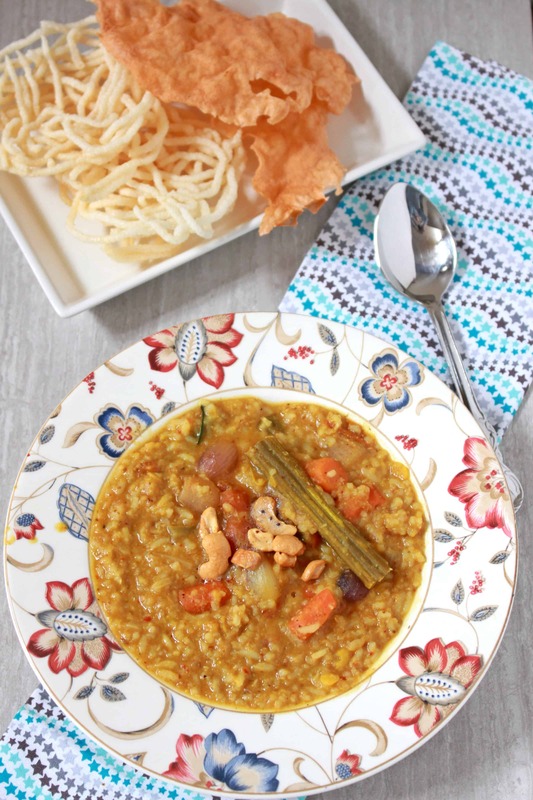 I was so excited to make the Sambhar Sadham recipe and made it over the weekend. 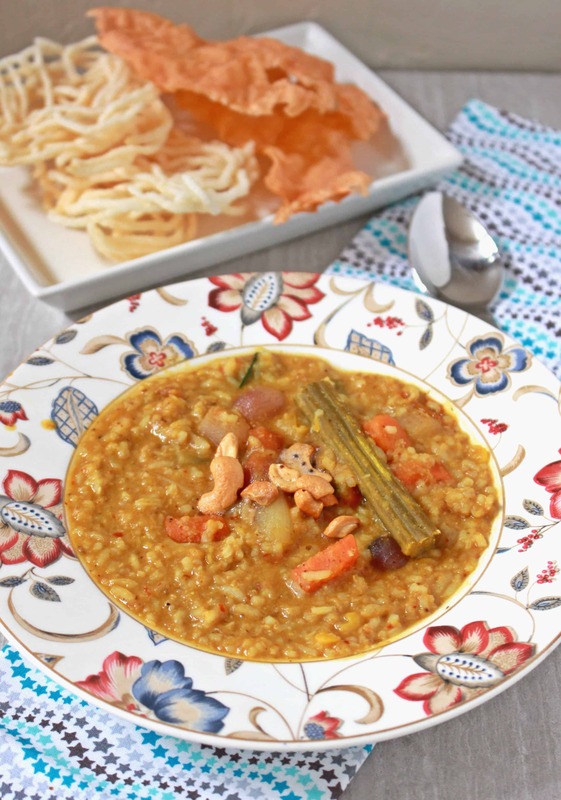 I make Bisi Bela Baath quite often and that is actually one of my monthly recipes that I make over the weekend. After making the Sambhar Sadham, I think this is going to come in as a competition to my Bisi Bela Baath. My little one loved this and he actually said that he likes this over Bisi Bela Baath recipe. I did a few changes in the way I cooked my rice and lentil (paruppu) for the recipe. 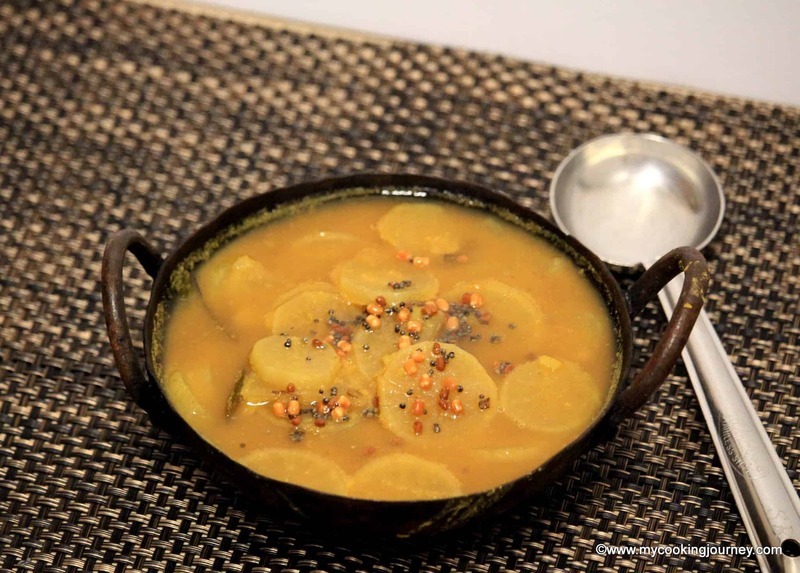 For Bisi Bela Baath, I usually cook the rice and lentil together and cook it a little mushy. For Sambhar Sadham, I wanted the rice to be not too mushy and hence I cooked them separately. I cooked them Pot in pot in my Instant Pot and again, I can’t be more happy than this with the Instant Pot. 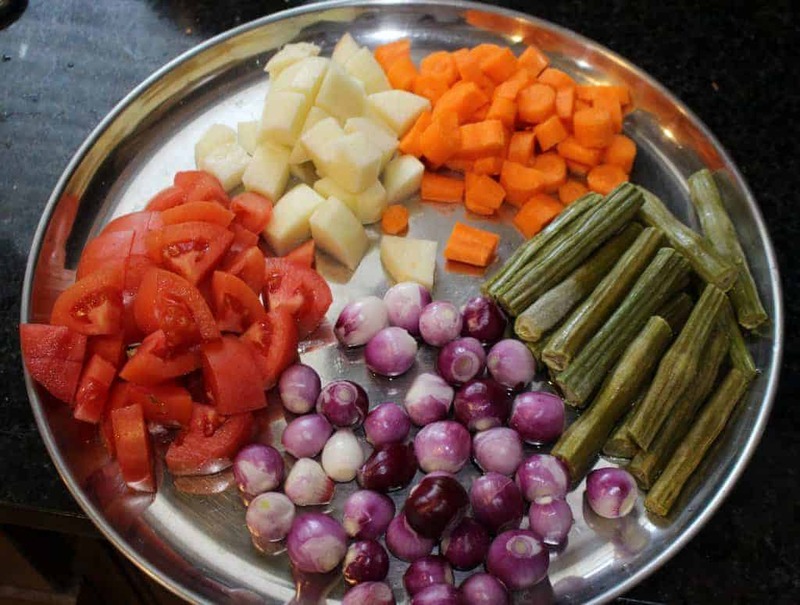 Any vegetables that can go into sambhar can be used to make Sambhar Sadham. I used pearl onions, drumsticks, carrots, tomatoes and potatoes. 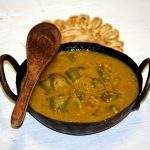 Eggplant would be a great addition for the Sambhar Sadham. I did not have any in hand, but would use it next time when I make it. 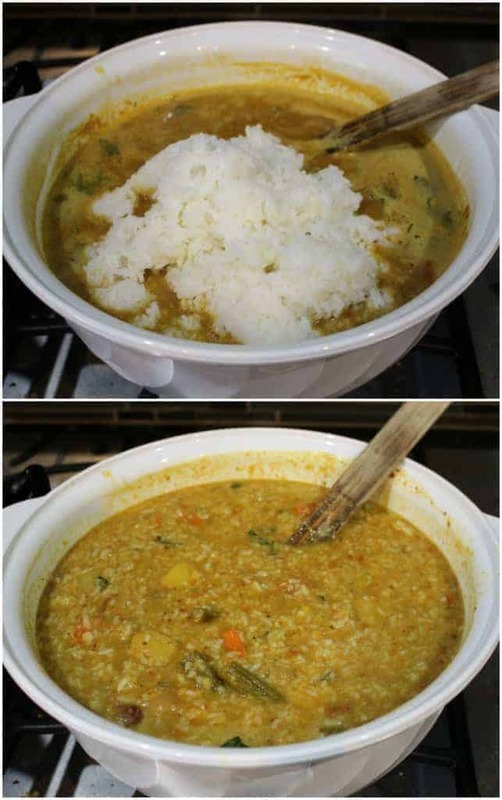 Cook the rice and toor dal separately and keep them aside. Mash the toor dal well and gently mash the rice as well. I like my sambhar sadham a little on the grainy side, so I don’t mash my rice too much. Soak the tamarind in hot water ( about 2 cups) and squeeze the juice. Chop all the vegetables and keep the ready. Fry all the ingredients mentioned under the list and once it cools down, grind it into a smooth paste adding a little water as needed. In a heavy bottom pan, heat 1 tbsp of oil and add the pearl onions. Saute it for 2 to 3 minutes in medium heat and then add the rest of vegetables. Fry the vegetables for about 5 minutes and add the extracted tamarind water. Add the sambhar powder, turmeric powder and salt and let the mixture boil well. The raw smell of the tamarind should disappear and also the vegetables should be cooked. Make sure that the vegetables still maintain their shape and not become mushy. At this stage, add the ground paste and mix well. Let it come to a gentle boil and then add the cooked toor dal. 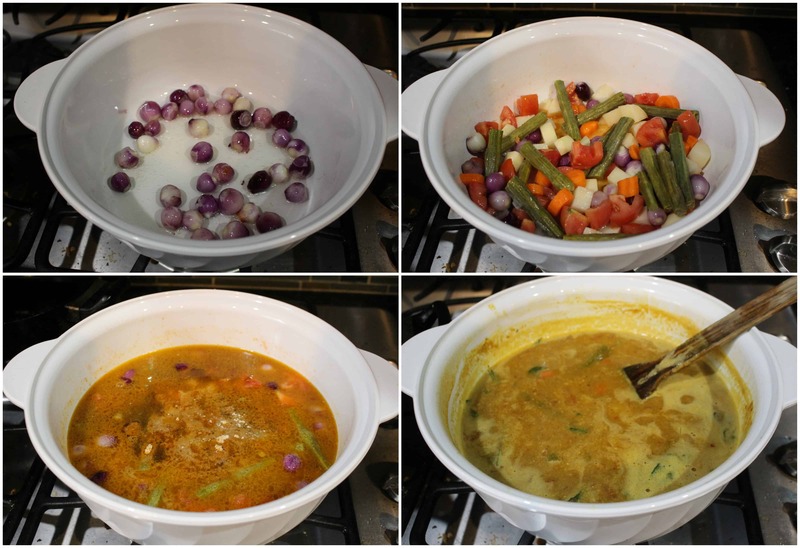 Mix well and let the sambhar boil for 5 to 7 minutes in low heat. Add the cooked rice and mix well. make sure that there are no lumps in the rice. 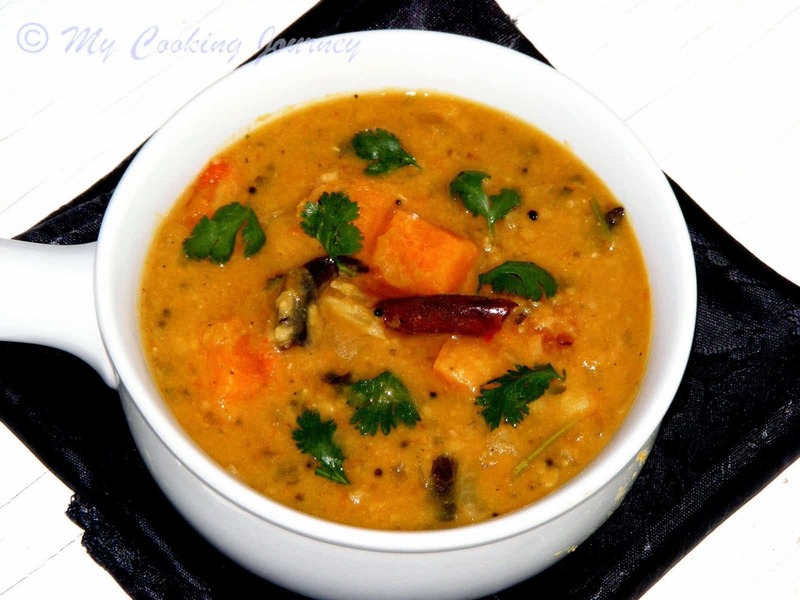 Let the sambhar sadham simmer for 5 to 7 minutes in very low flame. 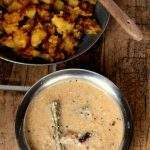 Serve hot with Appalam / Vadam / Chips. 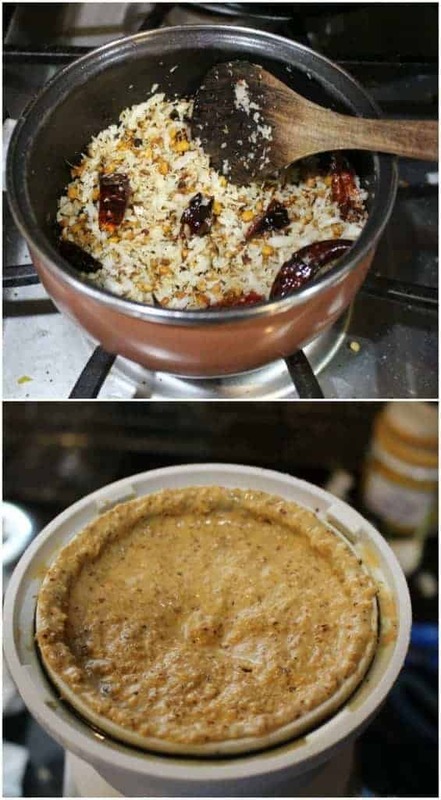 Cook the rice and toor dal separately and keep them aside. Mash the toor dal well and gently mash the rice as well. I like my sambhar sadham a little on the grainy side, so I don't mash my rice too much. 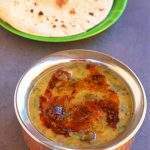 I am always intrigued by recipes that call for dal and rice to be cooked together. The drumstick and other vegetables with the freshly ground masala must have made this a very flavorful dish. 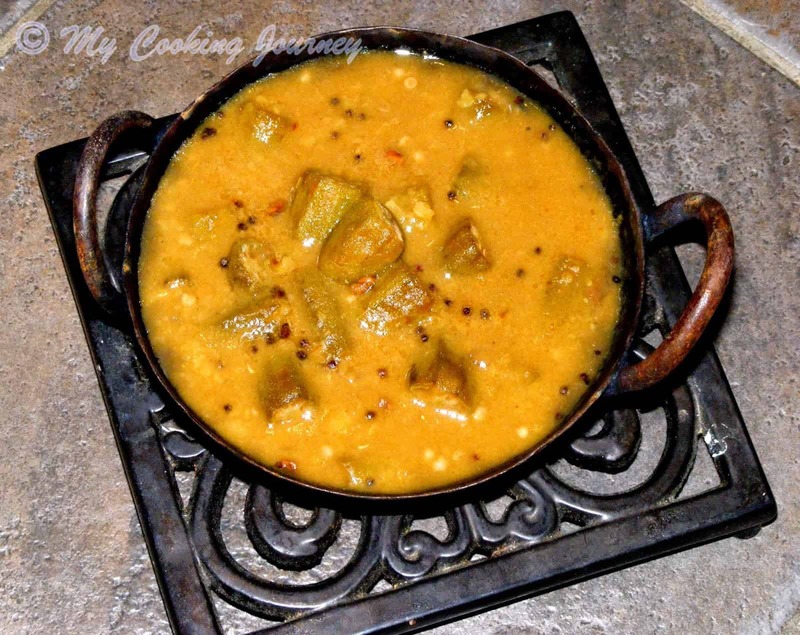 I love sambar Sadam and love it when it is googy..this is a wonderful dish and I would enjoy making it over the weekend! Never get bored of this sambhar sadham, my kind of comforting food. 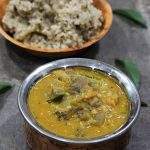 Even i love to make my sambar sadham with freshly grounded masala, which makes this rice more flavorful. Am just drooling here. That sambar saadam looks absolutely yum Sandhya. With appalam on the side this would make a nice filling meal..
I’ve yet to make both sambhar sadham and bisi bela baath. I too would have thought they are the same as they look similar. One pot meals are such a boon for busy days. 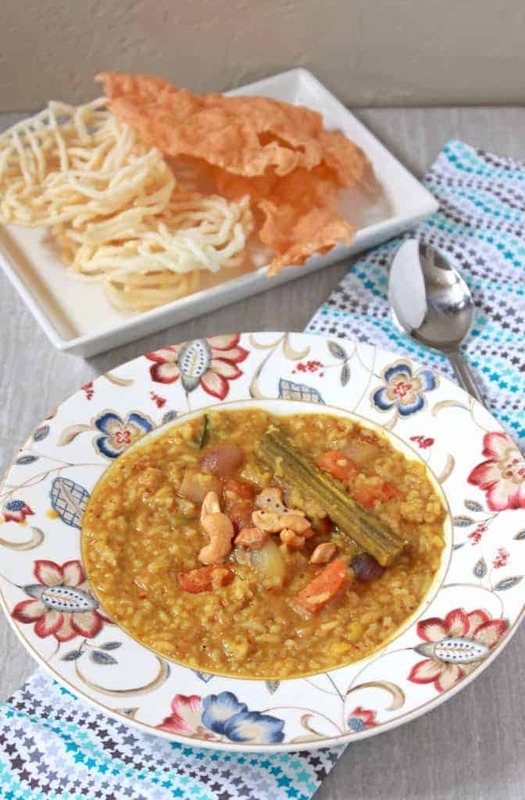 I never tried sambhar sadam… But your recipe makes me hungry.. looks so tasty will def try it. Bookmarked. This is such a comforting one pot meal. Liked your detail step by step explanation. Such a delicious One-pot meals..Perfect for packed lunches..